The assignment MUST be treated as a “work in progress”. This means you must work on your assignment progressively. You must start your assignment(s) as soon as the it is received. Students must use a 12 size font, double spacing and default Microsoft Word margins. Whilst question one is an essay, question two is a problem question and you must use the IRAC approach for question two of the assignment. Your work will be marked on the basis that you have followed the instructions above. 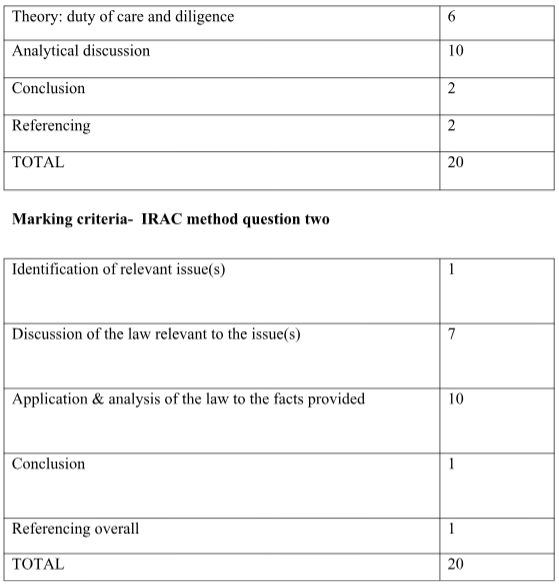 There is an IRAC document and a specimen question and answer in week one materials on LMS. There is also a video on IRAC in LMS. The assignment must be submitted as a Microsoft Word file. Do not submit as a PDF as it will not be marked. “There has been an increasingly heavy ‘duties and liability’ burden imposed upon directors of companies in Australia most particularly in relation to the duty of care and diligence. This is so much so, that today the duty of care and diligence imposes an onerously high standard upon directors of Australian companies along with extremely harsh consequences for breach. Reflect on the above and then discuss the nature and extent of the common law and statutory duty of care and diligence imposed on directors by the Corporations Act. You should also consider the liabilities and penalties imposed under the Act for breach. Your essay is not purely a theoretical exercise. You need to research the duty and develop your essay in such a way that you arrive at a logical conclusion as to whether or not you agree with the statement made. Thus, this part of the essay requires an analytical approach and you should extend your discussion beyond a mere description of the principles. Whilst a good descriptive coverage of the relevant principles and rules relating to the above is certainly expected, you must place your analysis in the context of the statement. Inebriated Ltd is an importer and distributor of boutique beers. The Managing Director is Claire. The company has no constitution and the board of directors exercise tight control over the company. Any purchase over $20,000 requires board approval. Last month Claire signed a contract to purchase beer for $25,000. The other directors do not like the beer and refuse to accept it on the grounds that Claire lacked authority and because she did not get approval from the board. Briefly discuss whether Inebriated Ltd can refuse to pay for the beer. (That is, you must discuss whether Claire had any authority as well as whether the lack of board approval is justification for non-payment of the beer). Use case law and relevant sections of the CA.